My friends Janet and John LeGrand of the truly fabulous Etsy shop, Paint Square in northwestern Alabama, recently remodeled their kitchen. 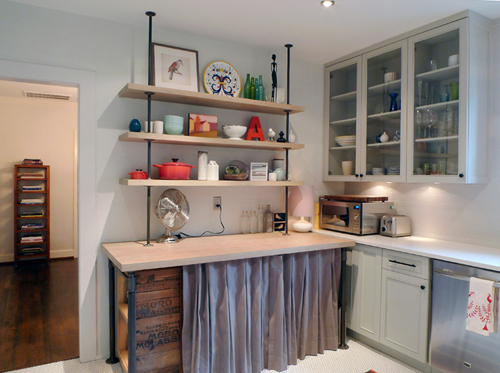 With a butler's pantry and a tight space of just 8' 6", they tore down an entire wall, removing the pantry and opening up the kitchen to a much more workable 12'. What a gorgeous job they did. They hired a contractor to overee construction but John is a handy guy and helped build many of the key features of this kitchen. The building is from 1930 so they used white penny tiles for the floor with dark gray grout to give it a historic yet modern feel. John built this gorgeous recess wine rack. 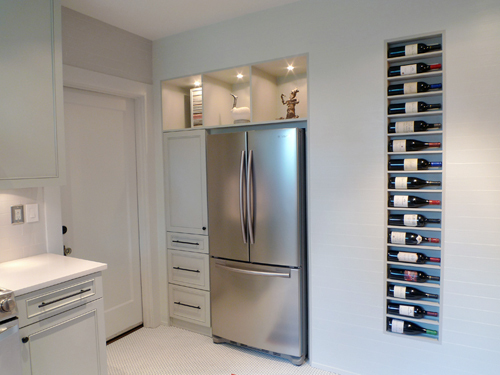 Each shelf is on a four degree slope so the wine bottles don't roll off. The lithograph print is Charlie Harper's Ladybug, a perfect complement to the space that plays well off the gray and white floor and the 'pop of red' Janet and John have created. Behind this curtain is a washer and dryer. Janet had a seamstress sew the curtains from a singular curtain found on sale at Restoration Hardware. As Janet explains, "John used plumbing pipes for the base of the table and the shelves and applied a unique process finish to get them the coloration that they are." I think this bar cabinet is my favorite feature of their new kitchen. John built this out of scraps of wood and an old crate. Recessed lights were added that are on a touch pad dimmer. 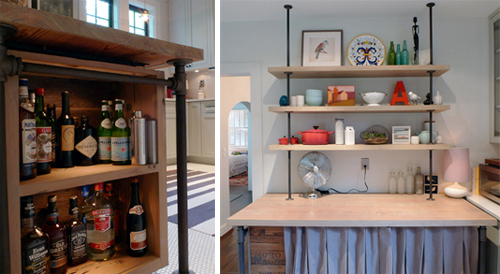 I just love the idea of taking something found and incorporating it into a more modern space. It adds instant character and personality to the room. Beautiful job Janet and John, thanks so much for sharing. I'll be posting about their Etsy shop again soon but if you get a chance, check out some of their new creations.